Wearing the correct colours can make you feel more energised, look less drawn and dramatically enhance your overall appearance. Here, stylist AMANDA BERNSTEIN explains how to find the right shade for you. Colour analysis is based on the findings of Swiss expressionist painter Johannes Itten (1888-1967). He noticed that when his students painted identical scenes, some would use ‘warm’ colours, while others would opt for ‘cool’ ones. In 1947 he researched this further and discovered that those students using mostly warm colours for their paintings had gold-toned skin with blonde hair and dark, warm-coloured eyes. However, the students who used cool colours had a blue-pink tone to their skin, ash hair and cool-coloured eyes. Instinctively, the students were naturally drawn to their individual colour tone. Think of walking in the park on a beautiful sunny autumnal day – rich shades of gold, orange-brown, yellowish-green (khaki), burnt red, camel and beige. Celebrities with a warm skin tone include Dannii Minogue, Anne Robinson, Jessica Biel, Sarah Ferguson and Chris Evans. Cool colours are those that have a blue undertone. Imagine a crisp and stark winter’s day with pure white snow, enhanced by crimson sky, icy shades of grey, blue, pink, fuchsia, purple, burgundy, slate-grey, black and white. Celebrities with a cool skin tone include Naomi Campbell, Anne Hathaway, Liz Hurley and Simon Cowell. You can establish if you have a warm or cool skin tone by following this simplified colour analysis procedure. You will need: Good natural lighting, a large mirror, a hairband to tie your hair away from your face, a white shirt or sheet and a cream shirt (matt fabric only). Ensure your hair is off your face, your neck and decolletage should be free of clothing and jewellery, and remove all traces of make-up. Your complexion is yellow-beige, golden-brown, peach or ivory. You may also have freckles and perhaps tan easily. Your eye colour is dark brown, dark green, dark hazel or dark blue. Your complexion is black, olive, fair, rosy or pale. If you have white skin, it very often burns in the sun. Now that you have established if you should wear warm or cool colours, the first thing you will notice is how obvious this has all become. Warm shades are predominantly colours with a yellow undertone – shades of brown, tan, green, teal, gold, burnt-orange and warm red. If you suit cooler colours, stock up on pinks, purples, lilacs, grey, burgundy, blacks and blues. 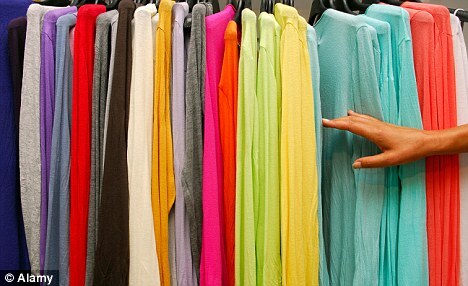 Every piece of clothing you own in the right tone for you will suddenly become your favourite. Shopping will be made easy – a process of elimination, where you are looking only for the colours that suit you, rather than everything that the store has to offer. Once you start following the ‘buy the right colour’ rules, you will discover that your clothes will start to coordinate with each other. You will also be able to mix and match so much more easily because everything will be in the same tone. It is worth noting that warmcoloured garments are generally adorned with buttons and metal trims in gold colouring. Cooler coloured garments (especially blacks and greys) mostly have silver trims. This means they will no longer clash with the jewellery you are wearing as you will find that warm skins suit gold jewellery, while cool skins look best in silver. This works right down to handbags, shoes and boots. Warm and cool colour rules also apply to make-up. Warm skins should be enhanced by foundation with a yellow base, and cheeks/lips work best in brown, coral or peach. With cool skin, opt for foundation with a pink base and cheeks/lips look best in pinks, plums and cool reds.